2. SEEK YOUR HELP – AN INVITATION! See excerpts below from the City’s current Snow Removal Policy as it relates to sidewalks, active transportation (AT) trails and park pathways. It’s a good read, and essentially ties the snow removal priority of the sidewalk or trail to the priority of the street it is located beside, unless it’s in a park. Is this good enough? Is this a clear policy? What are we missing? This is the policy for AT today, and I know it can be improved on. It my goal to do so in the time I have at City Hall. Winnipeg has made significant strides in developing the AT network in the past 15 years, and especially this year with the passing of the Pedestrian and Cycling Strategy. We need to continue work together to provide constructive advice and guidance on how we can move forward on the critical aspect of improving snow and ice removal for pedestrians and cyclists. After all, we live in a winter city! Who Clears What in the AT Network? Clearing the AT network of snow is completed by BOTH the Parks and Public Works departments – which often results in the public’s confusion (and mine too!). I will attempt to explain, but believe this highlights the need for improvements! This map shows the trails INSIDE parks which the Parks department cleans using their own equipment. They have limited resources and are only able to clear what is shown. I am not clear on the ‘timeline’ they set to have these pathways cleared, but will confirm. The South St. Vital Trail between St Mary’s Road and St Anne’s Road is located in a parkway – but it is cleaned by Public Works?! Not sure why, but it receives a Priority I cleaning! Note the broken lines in blue around high traffic areas and schools. A few years back, many of us worked to secure additional funding in the City budget to receive enhanced snow removal around schools and high use facilities. What does ‘enhanced’ mean exactly – good question. More snow removal. Should we put in the policy? Probably. Should enhanced be defined? For sure! NOTE: An absolutely amazing City employee put this map together for me in a very short window of time this week. I’ve since noticed what may be oversights, ie: need for better map title, missing sections of trail (ie:Bishop Grandin), omission of Yellow Ribbon Trail, etc. However, it’s not clear if this is an oversight or if these trails are not cleaned. Again, this map was put together very quickly, and much detail is involved in map development. I will investigate further but – here is where I am asking for HELP. Send me positive, constructive information on specific locations. SEND ME PHOTOS – a picture is worth a thousand words! Look at the Parks snow removal map. Should there be more trails cleaned? Of course, more cleaning costs more $$$. Do we know the volume of use? Probably not. So, tell me, and provide the case on why it should be cleaned. Look at the Public Works map for sidewalks and trails. What is missing? Are the priorities right? I will then check to see if it is an oversight by the map creator – or perhaps, it’s not on the list to be plowed? Review the level of cleaning. I know cleaning an AT network requires a level of detail that may or may not occur. Any suggestions or recommendations? My commitment: I’ll summarize all feedback I receive and share it for further discussion. Join me for lunch on January 18th at The Forks to talk Winter Maintenance of the AT Network and plan next steps. Provide input into the Winter Walkway Survey, being conducted by the Department of Geography at the University of Winnipeg. CBC provided a good overview of this project SEE HERE, and I’ve offered my support to the project researchers. How does the City’s current snow and ice removal policy relate to the Pedestrian and Cycling Strategies? See pages 230 onward. Do we need to update, improve the City’s current Snow Removal policy as it relates to the AT network? Let’s discuss. If you’ve made it to the end of this post, thank you. If you are going to help to positively improve winter walking and cycling conditions, THANK YOU!! Now get out there, document and report back! Sidewalks on Priority I and II streets within the Downtown shall generally be plowed to a paved surface whenever conditions allow. However, minor snowfalls and/or warming temperatures between plowing operations may result in a layer of compacted snow or ice on the sidewalk surface. A plowing operation shall be initiated when the snow has accumulated beyond a depth of 5 cm. The snow plowing operations shall be completed within thirty-six hours following the end of an average storm. For the purposes of this policy, the geographical area for snow clearing enhancements in the Downtown is established in conformance with the boundaries identified by the City of Winnipeg Downtown Zoning By-law. Sidewalks on Priority III streets shall normally be maintained to a compacted snow surface. Plowing shall normally commence when an inspection, following an 8 cm snowfall accumulation or equivalent local drifting conditions, indicates a necessity for a clearing operation. The identification of sidewalk plowing routes on Priority III streets shall be undertaken in such a manner so as to prioritize, wherever possible, sidewalks in the immediate vicinity of elementary schools. The snow plowing operations shall normally be completed within five working days following the commencement of work. Work on weekends and holidays shall be limited. Sidewalk plowing routes on Priority III streets shall be established so as to identify a designated access route from each senior citizen complex to the most logical Priority I or II street. Sidewalks on these access routes shall normally be maintained to a compacted snow surface. Generally, plowing shall commence when an inspection, following a 5 cm snowfall accumulation or equivalent local drifting conditions, indicates a necessity for a clearing operation. The snow plowing operation shall be completed within thirty-six hours following the end of an average storm and shall normally be done in conjunction with the sidewalk on the connecting Priority I or II street. For the purposes of this policy, senior citizen complexes shall be identified as a building that is devoted exclusively to senior citizens and has ten or more dwelling units. Plowing routes shall be established by the Public Works Department to identify a priority level for each trail, based on the functional use of those individual trails. The activities identified in this Clause will only be undertaken when adequate funds are available in the annual Snow Clearing and Ice Control Budget. Designated park pathways within community and neighbourhood parks shall normally be maintained to a compacted snow surface. Generally, plowing shall commence when an inspection, following a 8 cm snowfall accumulation or equivalent local drifting conditions, indicates an necessity for a clearing operation. The park pathway snow clearing operations shall be considered as a Priority IV undertaking and shall commence following completion of the City’s public sidewalk network. 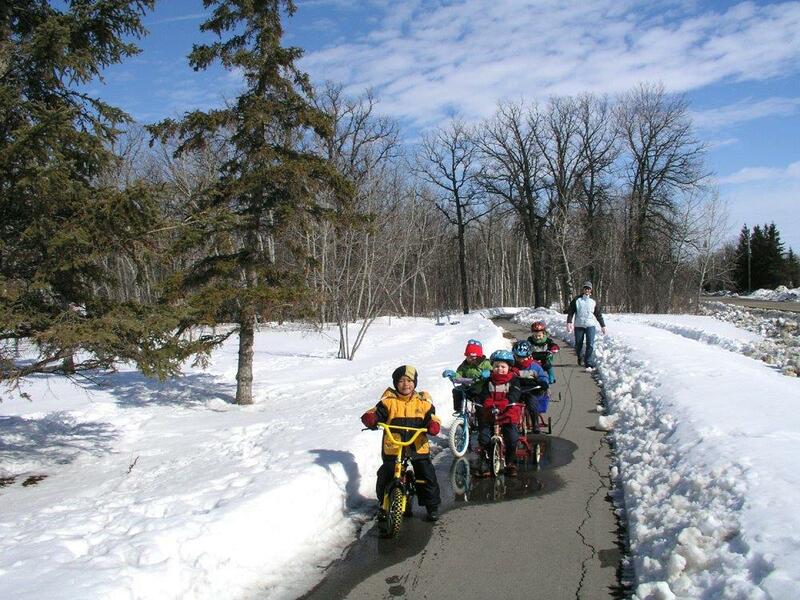 For the purpose of this policy, the clearing of snow on the City’s park pathways will be extended to include logical connections to the Active Transportation Trails as well as including major pathways within our community parks system and critical pathways in some of our neighbourhood parks. Those pathways to be cleared in the community and neighbourhood parks system shall be determined by the Public Works Department.